It seemed too good to be true: a 100% whole-wheat, yeast-leavened bread, mixed by hand in about a minute, with hardly any rising time at all. 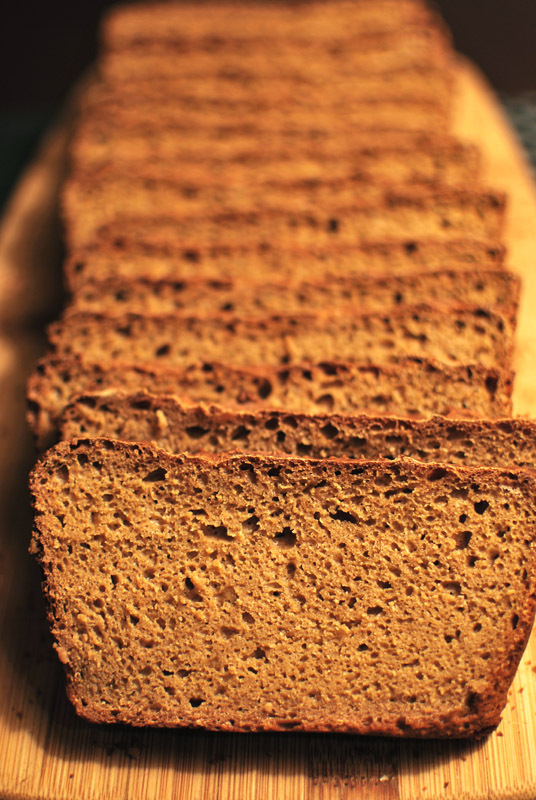 It was the promise of a yeast bread with a quick bread’s method that convinced me to try it, despite any educated misgivings; but it was the result that convinced me to throw the recipe out in the end. Like most things that seem too good to be true, this bread was just that. The text accompanying the recipe assured me that I could expect a moist loaf, one that would stay so for days on end. And, truthfully, it was indeed moist; but moistness alone does not a good bread make. The picture in my cookbook showed domed, pretty, golden-brown loaves in a state of bucolic repose on a wooden table, certainly come upon by chance in some British farmhouse. They looked as much like my loaf as a peacock looks like a chicken. What I pulled from my oven was a morose brick, so flat on top you could serve drinks on it. In fairness, it did slice easily, and it was quite moist. But this creature between two bready worlds – the yeast-risen one, and the chemically-leavened one – possessed none of the best qualities from either. True, it had mixed together in as little time as any other quick bread, but it lacked the delicate and fluffy texture that marks even a mediocre example of the breed. And though there was no need to worry about overmixing, as the gluten formed by mixing is always desirable in yeasted breads, there simply was not enough formed to capture the gases given off by the yeast, resulting in practically no oven spring at all, and the aforementioned flatness. Additionally, the dough simply hadn’t had time to properly ferment, the step that produces all the complex flavors found in the best yeast breads. Yes, I did end up with a yeast-leavened bread in about one hour; but what’s the point if no one cares to eat it? Generally, whenever a food I make turns out so very different from what was promised, pictured, or expected, I assume the fault must be mine. And perhaps the extra ten minutes I accidentally let the bread rise did, in fact, make all the difference; but somehow, I’m not convinced. I would like to try this one again, being sure to follow the recipe with more exacting precision, though I’m not sure that attempt will be successful either. No matter the outcome, though, I’ll be sure to keep you updated. 1. Preheat the oven to 400° F. Butter a 9 x 5 inch loaf pan; set aside. 2. In a large bowl, whisk together the flour, salt, and yeast. Mix together the water and molasses, stirring to dissolve. Add the water to the flour mixture, and stir together until well combined, and a sticky, wet dough forms. 3. Transfer the dough to the prepared loaf pan. Cover loosely with plastic wrap, and let rise in a warm spot until the dough has grown by one-third, about 30 minutes. 4. Bake at 400º F for 40 minutes, or until well-browned on top. Cover loosely with aluminum foil, then continue to bake for about 10 to 15 minutes longer, until an instant-read thermometer registers about 200º F when inserted into the middle. 5. Let the bread cool in the pan briefly, then turn out onto a rack to cool thoroughly. Bergamot: Such trust in my opinion! I’m flattered! If a recipe sounds good to you, though, I say give it a shot. Personally, I didn’t do well with it, but you might just have the knack. What’s the worst that could happen? 😉 Happy baking! I’ve had mixed results with it but usually positive – I tend to mix in linseed, toasted pumpkin seed or similar fancies to spark it up.